Why is my back pain worse in the morning? The spine is made up of bones called vertebrae and in between each vertebrae is a structure called the intervertebral disc or IVD. The disc is like a sponge and absorbs shock between the bones consisting of a high percentage of fluid. During the day we perform tasks such as sitting, bending, lifting and twisting, all of which cause compressive load on the disc in our back. This load forces fluid out of the disc known as disc dehydration. During the night our disc is offloaded for 6-8 hrs. (depending on how long you sleep for) and undergoes a rehydration process allowing the body to restore the fluid lost throughout the day. This rehydration leads to the spine becoming stiffer when we first wake up as the disc is now occupying more space within the joints. This is often why when you first wake up it is harder to get going and the back pain you experience is often increased. This is also when we are at our tallest so if you want to grow a few CM always measure yourself first thing in the morning. As the disc has rehydrated and there is more stiffness/less flexibility, this increases the risk of injury first thing in the morning. Therefore there are a few easy tips to reduce further injury and also help with that morning pain you are experiencing. Avoid any flexion activities when you first wake up. This includes ‘stretches’ to touch your toes or often even bending down to pick up objects or put on your shoes without warming up first. No heavy lifting: If you like to train first thing in the morning (within the first hour of waking) it is important that you do not load the lumbar spine too much or introduce twisting or flexion activities as this will increase your risk of injury. Try sleeping on your side. 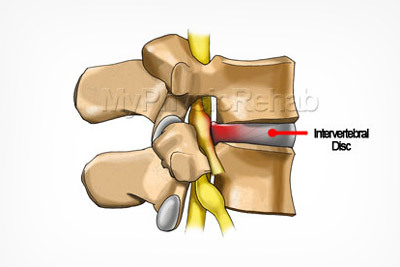 When you sleep on your stomach this puts more load through certain parts of the disc/ligaments. The best stretch to carry out first thing in the morning is gentle lumbar extensions. Start extending up to your elbows then progress up to full arm extension repeating 10-15x. This allows any minor altered disc fluid migration that may have occurred during the night to be “centralised” and ease some of the discomfort experienced . see below for an example of this exercise.